Download the borrow-it app and register as a user. We encourage you to post at least one item that you would be willing to lend before you can start using the app (but there is no obligation to do this). We suggest you to accept push notifications otherwise your lending/borrowing opportunities will be more limited. After registering as a user you can search the existing items listed. If the item you’re looking for isn’t listed, you can then make a request to all borrow-it users using the Request-it function. You can set your request to be within a defined area. If someone has that item to lend, they can reply via the messaging function. Once a decision to proceed is agreed, the item will need to be uploaded for the lend to proceed in the usual way. Make sure you post feedback on any borrowing/lending transactions. This will help future borrowers decide who to borrow something from. Users can review feedback and ask questions using anonymous in-app messaging. 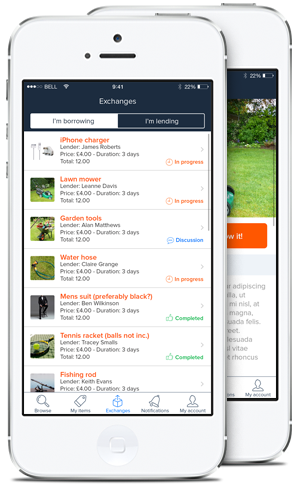 You can list any items you own that you are willing to loan out. Find some inspiration here for items that people might want to borrow. Think of things that people might like to try before they buy, higher cost items that people may only use once or occasionally or bulky items that not everyone has the space to store. You also might want to make some money back on something you have spent a bit of cash on. It is entirely up to you how much you charge for lending the item, but if it is available from hire companies, you would be wise to make your borrowing fee less than the going rate. Look out for push notifications from the anything anywhere function as you may be able to lend something that another user has requested to borrow. Once a loan is agreed, contact details are exchanged to arrange the exchange of the item and payment is set up through PayPal. The app will remind you when items are due to be returned. Payments are made using PayPal. In addition to standard PayPal fees, borrowers will be required to pay a fixed borrow-it charge of £1 per loan regardless of value.